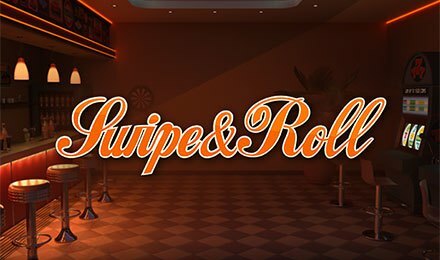 Travel back to the past with Swipe and Roll Slot at Moon Games! It is a well-crafted game by NetEnt, made up of 5 reels and 20 paylines. The reels of this game are set against a chrome-lined structure resembling a traditional jukebox. The background shows a vintage cafe, with a metal-topped bar to the left and new slot machines to the right. On the reels, you can see symbols like Watermelons, Plums, Oranges, A, K and Q. Play this classic slot at Moon Games using different types of devices! Begin by selecting a bet level on the Level display of Swipe and Roll Slot. Next, use the Plus and Minus signs on the Coin Value field to choose your preferred amount. If you want to place the highest stake in one click, you can make use of the Max Bet tab. The Auto Play button is also at your disposal to launch a number of games played successively. Bet Levels: You can select a maximum of 10 bet levels on this game. Amount of Paylines Selection: The 20 paylines remain active during your gameplay and cannot be changed. Coin Values: The different coin values you can choose from are 0.01, 0.02, 0.05, 0.10, 0.20 and 0.50. During the main game and Wild Re-spins on Swipe and Roll Slot, the Wild Diamond symbol can show up on any reel. However, the x3 Wild appears only on reels 2, 3 and 4. Both of these Wilds replace any symbol, except for Scatter and other Wilds. A x3 Wild also triples the payout to which it contributes. The Bell stands for Scatter and helps to activate the Wild Re-spins feature and Bonus Game. The Coin Wheel Feature on Swipe and Roll Slot is randomly activated during the main game. The Coin Wheel contains coin wins, Scatters and Arrows. If you win a Scatter during this feature, you can trigger the Bonus Game. As for the Arrow, it expands the win zone to allow for better prizes. Land 3 Scatters on reels 2, 3 and 4 during the main game and Wild Re-spins to activate the Bonus Game. Swipe 3 wheels in any order, either up or down, to receive coin wins or Arrow symbols. Three or more Wild symbols anywhere during the main game trigger the Wild Re-Spin Feature on Swipe and Roll Slot. These Wild symbols then lock in the same position for a free re-spin. Play Swipe and Roll Slot at Moon Games where lots of amazing games are awaiting you. Wish you all the best!